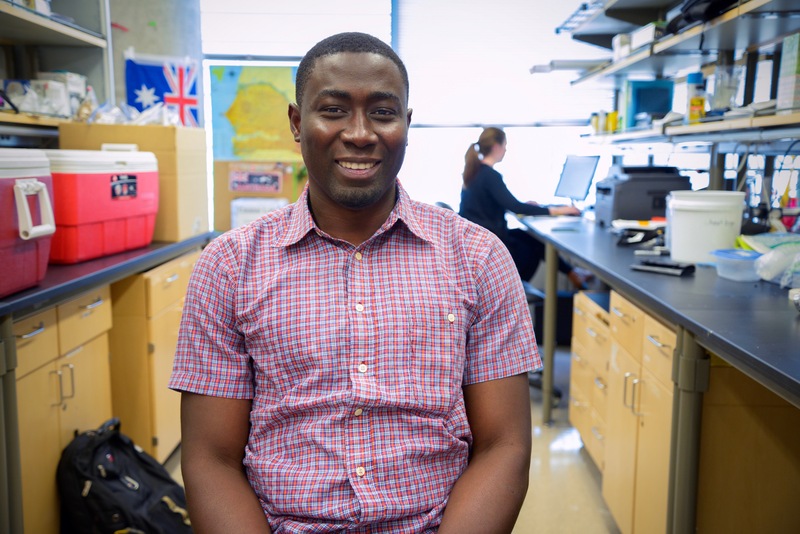 As a Mastercard Foundation scholar at ASU's School of Life Sciences, he jumped at the chance to try new things — conducting research as an undergraduate in the school's SOLUR program, starting a nonprofit organization to assist farmers in his native country, and speaking at a conference of TEDxASU innovators in 2018. Majoring in biological sciences, Manneh worked alongside Assistant Professor Arianne Cease with the Julie Ann Wrigley Global Institute of Sustainability and life sciences Research Professor James Elser, conducting studies on locusts. After gaining hands-on experience conducting research both in the lab and in the field, he's now interested in studying public health and understanding how hunger, malnutrition and infectious diseases affect populations in the least-developed countries in the world. In 2016, Manneh was named the recipient of the President William Jefferson Clinton Global Hunger Leadership Award. And as a graduating senior, he has earned the School of Life Sciences' Outstanding Graduate award for 2018. He has deferred a PhD scholarship at the University of Melbourne to pursue a master’s in public health at the University of British Columbia in September. Answer: I knew that I wanted to major in something science- and biology-related after I graduated high school, but I didn’t know what exact major to pursue. Luckily, after high school, I worked for a while at a research institution and this enabled me to figure out what exactly I wanted to focus on. This early exposure to the research environment, where I had the opportunity to rub shoulders with researchers, is what essentially led me to my “aha” moment because I wanted to be able to do what these researchers were doing. Out of all the majors at ASU, I decided that I wanted to do biological sciences. A: At ASU there is so much to learn, and I realized this from the first week of my first semester as a freshman. Besides the theoretical scientific knowledge that I have acquired over the years, my daily interaction with people from all over the world here at ASU has taught me so much. One of the many things I’ve learned here at ASU is that there is always someone out there who has the solution or knows someone who has the solution to a problem you might encounter whether in the classroom or outside. This knowledge has significantly transformed the way I interact with people. It has allowed me to reach out to the necessary people and make the necessary connections with people. A: For me, coming to ASU was a big deal, a huge opportunity that has transformed my life. I was one of several other students from various African countries who were selected to come study at ASU under the Mastercard Foundation Scholarship Program. So, technically, ASU chose me. Prior to coming, I read about all the interesting research that was happening here at ASU, and this was another reason why I was really excited to come to ASU. A: Well, I have two pieces of advice for those still in school. First, I would say, manage your time properly. Sometimes the difference between someone who does well academically and someone who doesn’t is in the way they manage their time. My second piece of advice is, study hard but understand that doing badly in one or two classes is not going to ruin that dream of going to med school, becoming a scientist, etc. Failure is an integral part of success, however — the only problem exists when failure becomes a habit. In summary, manage your time wisely and don’t be afraid to fail because the truth is, everyone fails in something at some point. A: The third floor of Hayden Library was literally my second dorm room. I have lost count of the number of times I have spent all nights studying for tests or writing lab reports. It is one of the places I will miss besides the MU. A: My immediate plan is to go to graduate school. I have been offered a PhD scholarship at the University of Melbourne, and a master’s scholarship at the University of British Columbia. We will see what happens next, but my long-term career goal is to become a research scientist and conduct public health-related research. A: I would invest the money in conducting research on a parasitic disease called malaria, which is transmitted by female mosquitoes. There has been ongoing research on the disease for several years now, but I think the $40 million would help us get rid of the disease faster. It is a big problem because it claims the lives of millions of people all over the world, especially in developing countries. A: As an international student, when I got to ASU, everything was essentially new. Another continent, another country and different food. I had a lot of adjusting to do in my first year, but after that, things were pretty normal. A: I have received a tremendous amount of support throughout my time here at ASU. My two professors and faculty advisers, Professor James Elser and Assistant Professor Arianne Cease, have truly been very supportive in helping me with recommendation letters and giving me encouragement and advice. A few office hours when I was taking BIO 151 with Professor Elser in my freshman year resulted in other connections that have helped me find a home away from home here at ASU. My MCFSP (Mastercard Foundation Scholarship Program) family has also been very supportive, from the director, Dr. Baxter and all the other staff members, their work made life much more comfortable for me and the other scholars. A: Overall, I think my undergraduate experience was great. I learned a lot and made a number of lifelong friendships and connections. Q: What did ASU provide to you that you think you could not have found anywhere else? A: As one of the big, if not the biggest public research institution in the country, ASU provided me with a lot of opportunities to engage in undergraduate research which I think wouldn’t have been possible at other institutions that are not research-oriented. I am glad I was able to make use of the opportunities to work in a research lab and acquired relevant skills that will come handy both in graduate school and beyond. 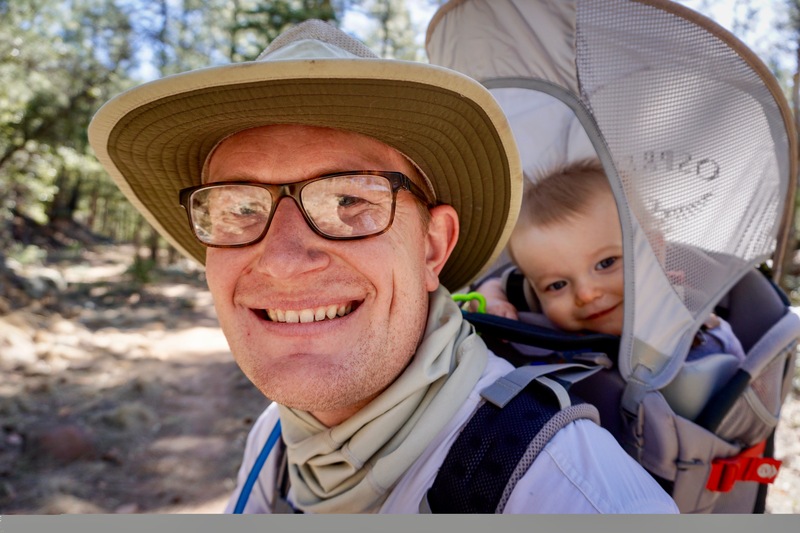 Such is the case for Max Wilson, a School of Life Sciences student and Phoenix native who is graduating in May with his doctorate in biology. As an undergraduate, Wilson was a biology major focused on taking classes in a pre-med track. But in the middle of earning his degree, he took a conservation biology course from Professor Andrew Smith and was struck by how much fun his job seemed. Enamored with the idea of working outside and saving species to make a living, he was hooked. Not only did Wilson embrace a new career path, he decided to stay at ASU to earn three degrees to follow his passion, mainly because he believed in the inclusive vision of ASU’s New American University. Answer: I came to ASU only vaguely aware of how lucky I am. I am a white male who grew up surrounded by a loving, well-educated family in a comfortable (if not luxurious) home. As a child, my parents took special care to ensure I could experience the things I wanted to experience, from playing football to fly fishing, and that I learned the lessons I needed to learn along the way. Coming to ASU and meeting people of completely different backgrounds, ethnicities, sexualities and familial circumstances made me confront just how privileged I have been and continue to be. It has been an unbelievable learning experience. A: I did all three of my degrees at ASU: BS, MS, and PhD. As an undergrad, I decided on ASU because I truly believe Dr. Crow’s vision of the New American University, a university whose quality is defined by the graduates it creates, not the applicants it rejects. To be honest, I loved the idea of going to a school that was inclusive by nature (and I would be lying if I didn’t say that I equally loved the idea of proving people who look down on inclusive schools such as ASU wrong). As a master’s student, I choose to stay at ASU to work with Andrew Smith on the conservation of plateau pikas, a truly important and unbelievably cute mammal that lives on the Tibetan Plateau. For my PhD, I had the opportunity to work with School of Life Sciences Professor Jingle Wu, the world’s foremost landscape ecologist, which was an opportunity I simply couldn’t pass up. A: Make friends with people who will tell you when you are being stupid. Then listen to them. A: Since it first opened when I was an undergrad, I have always been a sucker for the patio near Engrained on the second floor of the MU. A: I am in the process of looking for an academic job in my field. A: That’s a hard question — $40 million seems like a lot of money, but it would go fast if you were working on a big problem! At that price range, I would love to build a program partnered with a university that brings environmental education into underprivileged schools and provides direct interaction, coaching and mentorship for these students as they transition into environmental degrees. A: School, at every level, is tough. It is supposed to be. As an undergrad, you have to learn how to take care of yourself at the same time you are engaging with the hardest classes you have ever taken. As a graduate student, you have to learn how to interact with the broader academic world on the fly, while also balancing a slew of classes, research and more grown-up problems, like kids of your own. The key to my success was building an excellent support structure — old friends, new friends I met along the way, a supportive family and an unbelievably patient wife. A: I could never have done this without my family, especially my wife, Angie, my sons, Jack and Henry, my mother and father, Mark and Michele, and my sister, Amanda. I am also indebted to my adviser, Jingle Wu, who was patient and supportive of me as I undertook my dissertation work; Andrew Smith, who started me along this path and provided excellent companionship along the way; and Sharon Hall, who was an exceptional role model to look up to. Finally, I’d be remiss if I didn’t thank all my friends, especially Mark and Jenna Golab, Sarah and Alan Tippins, and Matt Curry, who provided support when they could and scotch when they couldn’t. A: Especially as an undergrad and early in my graduate career, I always moved way too fast and paid little attention to the details. This came back to bite me more than once. I would have slowed down and made sure I did things right the first time. A: The beauty of ASU is that it is a school you can get into. You don’t have to be an egghead, and you don’t have to have rich parents. All you have to have is a desire to learn and a willingness to work hard. Though it is hard to put a finger on, there is something truly special about being surrounded by thousands of normal people who are trying to make their lives better. There are lots of other big schools, and there are lots of more exclusive schools, but with its explicit focus on inclusion, ASU is unique in this regard and I have loved every moment of it.